The Persian language is quite old and its history is very interesting. 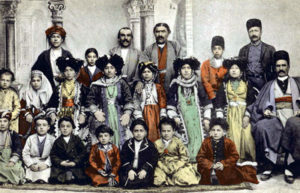 Parsi or Persian was the language of the Parsa people who ruled Iran between 550 – 330 BCE. It belongs to what scholars call the Indo-Iranian group of languages. It became the language of the Persian Empire and was widely spoken in the ancient days ranging from the borders of India in the east, Russia in the north, the southern shores of the Persian Gulf to Egypt and the Mediterranean in the west. Persian is a subgroup of West Iranian languages that include the closely related Persian languages of Dari and Tajik; the less closely related languages of Luri, Bakhtiari, and Kumzari; and the non-Persian dialects of Fars Province. Farsi, or Persian, is a language spoken in a limited number of countries that include Iran, Afghanistan [known as Dari], Tajikistan [known as Tajiki] and as a minority language in several adjacent countries such as Iraq and Uzbekistan. Farsi is the mother tongue of more than 150 million people around the globe. It is spoken primarily in Iran, a country which plays a crucial political role in the Middle East and the Persian Gulf region. It is descended from Persian and has influenced languages in several nearby countries in south and central Asia. It is a member of the Iranian language family and is spoken by up to 130 million people. Classical Persian remained essentially unchanged until the nineteenth century, when the dialect of Teheran rose in prominence, having been chosen as the capital of Persia by the Qajar dynasty in 1787. Middle Persian is the language spoken during the Sasanian era also known as Pahlavi. We have plenty of writings from that era in the form of religious writings of the Zarathushti religion, namely the Bundahish, Arda Viraf name, Maine Khared, Pandnameh Adorbad Mehresfand etc. New Persian is a successor to, and derived directly from Middle Persian, and can be considered as having two phases: classical and modern – although both variants are mutually intelligible. With the coming of Greek as the language of rulers and bureaucracy, the old system continued as a parallel to Aramaic. 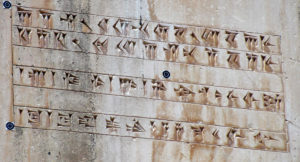 But scribes in Parsa or Fars began to insert Persian words into their Aramaic texts, or add Persian endings to an Aramaic word, and thus the system known as Huzvaresh for Middle Persian began to develop. This system of writing meant that a word would be written in Aramaic but would be read as Persian, thus ‘hdwn’ meaning ‘to take or hold’ in Aramaic would be read in Persian as grift. The Persian language is considered the language of love, poetry and the path to understanding aspects of the great spiritual heritage of mankind.